The Skutt FireBox 14 is the perfect compact kiln for fusing glass tiles, with a square chamber that holds a full square foot of 4" × 4" tile. Its top-fired design heats each tile uniformly. The three-button controller has programming features for beginning or advanced artists. The wood handle stays cool, making it easy to look inside when the kiln reaches the desired temperature. The lid has been redesigned to remove the pins that previously held the elements in place. This improved design eliminates the potential of pins falling into fused glass pieces. 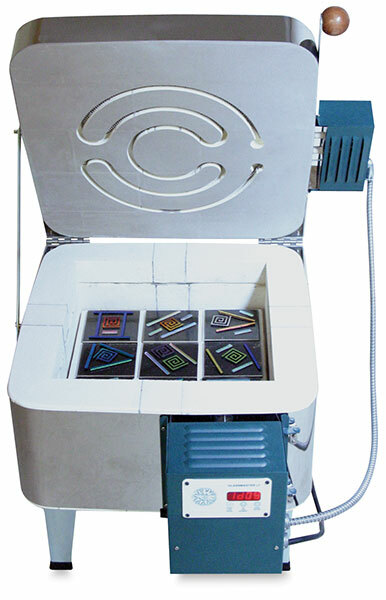 The Skutt FireBox 14 operates on standard household voltage. Accessory Kit — Includes one 13" × 14" shelf.